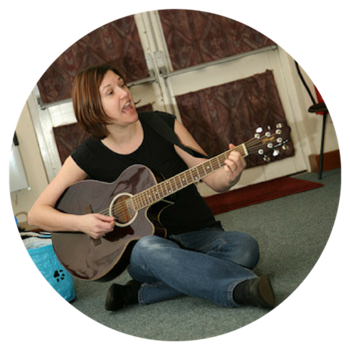 Musical abc has been developed and is run by me, Anne, a qualified primary school teacher, musician, composer and mum! I have been running classes for the under 5s since 2008. Music has been a big part of my life: I play the piano, clarinet and guitar; I have composed music since I was at school; and have participated in school orchestras, choirs and musical productions. I studied musical composition at Coventry Centre for the Performing Arts, before qualifying as a primary school teacher in 1998. As well as teaching reception children, I was the school music co-ordinator with responsibility for promoting music through lessons and extra-curricular activities such as school choirs. Music is always at the heart of my teaching: from singing a motivational rap with the whole school to introducing the days of the week through song. For every child, at least the under 5s, to have a quality music education! A very big ask! How? By giving Early Years practitioners the knowledge, skills and confidence to bring music into their setting.